Although most modular stages come in standard and relatively simple design, they can be easily customized to suit the occasion. When it comes to dressing up portable staging, there is a wide variety of options. From adding clip-on closure skirting to choosing the top decking material, you can give your portable staging system a polished and unique look. When dressing up the stage, you should consider both the audience perspective and the needs of the performers. For instance, the top decking will be mostly used by the people on the stage, while the sides of the platforms are seen by the audience. You need to address those issues when dressing up the stage and applying finishing touches to the portable staging. Skirting is usually the first thing that comes to mind when dressing up a performance stage. The accessory provides a classic and clean appearance. The standard skirting is black, but other options are also available. It is usually offered with clips of durable plastic and loop side Velcro allowing quick and hassle-free set up. The skirting doesn’t require any special cleaning treatment and maintenance. You can either remove them or leave them in place, when the platforms are stored. You can choose either fixed or adjustable height depending on your needs. 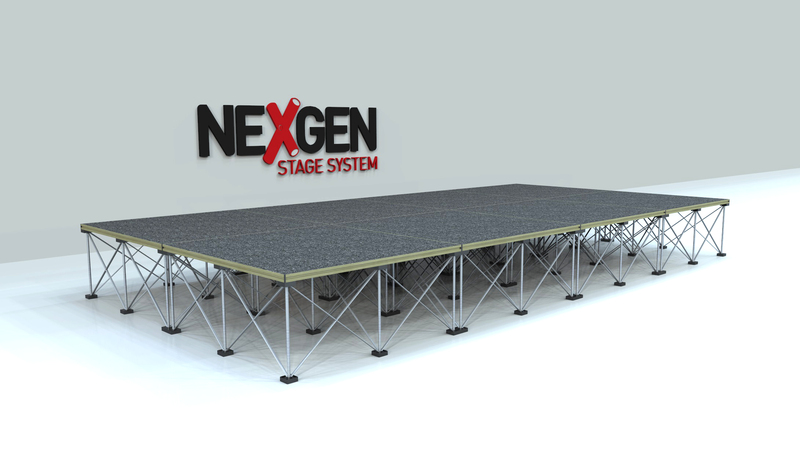 The standard portable staging systems consist of aluminium frame with top decking and aluminium legs. The decking can be selected in different materials, including bare plywood, carpet, polyvinyl and ply. The surfaces vary in their basic cleaning and maintenance needs. The aluminium frame can be provided in mill finish, black powder-coating and black anodizing. Closure panels are a great choice for seating riser system or semi-permanent stage. They serve to prevent the chairs from slipping between the platforms levels and a give a finished look to the stage. Closure panels are made of sturdy materials such as aluminium, veneer, solid hardwood or a material that matches the top decking. Like stage skirt, the panels are attached to the side of the aluminium extrusion with plastic clips. To remove the closure panels, use a simple T-handle tool for tear-down and gaining access to the area underneath. These features are highly customizable and can fit any performance space. Make the most of your portable staging by choosing the right features for the specific occasion. These details provide easy cleaning, storage and maintenance and will raise the game of your stage!